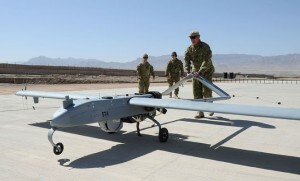 The Australian Army’s new Shadow 200 Tactical Unamnned Aerial System (TUAS) has officially commenced operations in Afghanistan, providing an enhanced Intelligence, Surveillance, Target Acquisition and Reconnaissance (ITSAR) capability to the International Security Assistance Force. The Shadow 200 replaces the ScanEagle which has been in operation since mid-2007. Chief of Joint Operations, Lieutenant General Ash Power said the ScanEagle had made significant contributions to force protecton and situational awareness, operating an average of 22 hours per day for the last four years and 10 months. “ScanEagle has been the vehicle for the Australian Army to develop its Unmanned Aerial Vehicle (UAV) capability and the Army is now taking the next step by employing the Shadow 200 TUAS,” LTGEN Power said. The ScanEagle flew approximately 32,000 hours in Afghanistan and over 6,200 missions in support of the Reconstruction Task Force, Mentoring and Reconstruction Task Force, Mentoring Task Force, Combined Team – Uruzgan and the Special Operations Task Group.